Putting a stove in a yurt is very straightforward. The stove needs to be strong, not too heavy and relatively small so that it can be easily transported (at least if the yurt is not permanently stationary). Our Greenheart stoves are ideal for use in yurts as they are light, come in a range of six different sizes and have a flat top for cooking. They also have a mesh guard around the stove body, which is an added safety feature in a situation where things like blankets, children etc can all too easily come in contact with the stove. We also stock a range of light and easily assembled flue pipe that goes with them. If you wish to put a stove in a tent please look at our Stoves in tents page. A small section of canvas is replaced with an aluminium panel, sealed to which is a silicon flashing cone. The stove flue pipe is simply slid through this when the tent is assembled and forms a safe watertight seal. The flue pipe (which comes in one metre lengths) should ideally run up to just above the height of the yurt to ensure a good draw and a rain cap stops rain entry at the top. Yurts have been and are still used as homes throughout Central Asia. 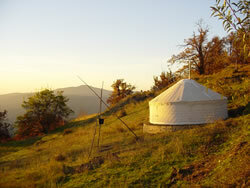 A yurt is perhaps the ultimate tent. Wooden trellis forms the walls of the yurt, rising straight up. This means that a yurt has a lot of headroom in it whilst not having a huge overall height. A central wheel (or 'crown') of wood sits at the apex of the roof and wooden poles radiate out from this to the top of the yurt walls. A canvas cover sits over everything making the yurt waterproof. Yurts are truly beautiful structures and are somehow 'friendlier' and definitely cosier than modern tents (at least the modern tents I have been in). Several years ago we were in Ladakh in northern India designing stoves for the Ladakhi, and Tibetan refugees, nomads that live in the Chang Tang. These stoves were for cooking and heating and designed to be made by local blacksmiths. They needed to be simple, light and strong as they were taken down and transported by Yak very frequently. The nomad tents (not yurts) were made from woven yak and goat hair and, while wonderful to look at, were neither draught-proof nor warm and so stoves were very much needed, particularly as there was so little fuel around. I have stayed in Kazak yurts in Chinese Turkestan and these, in contrast, were extremely warm and comfortable (despite it snowing for a lot of the time) even though they had open fires rather than stoves. They were covered in felt rather than canvas, which suited the colder and drier conditions, and the extra weight was ok as they did only two major moves a year (between winter and summer locations) as opposed to the Lhadaki need to move every few days as the grazing is so poor. You can easily buy a yurt in the UK from Woodland yurts. Woodland yurts are a friendly family run company based in Somerset. Woodland yurts make Mongolian gers - a type of yurt with straight roof poles, as well as bentwood yurts - a type of yurt with curved roof poles. The yurts are handmade from a selection of handpicked sawn ash, sawn oak, coppiced hazel, coppiced ash and coppiced willow. The woods are beautifully finished and oiled and the canvas cover made to measure. 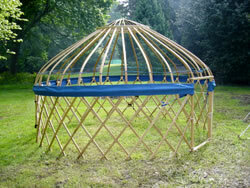 The Woodland yurts website also has a free, clear to read, online instruction manual on how to build your own yurt. Unless you are a competent woodsman I would be inclined to leave it to the experts (as they are very reasonably priced), but it makes interesting reading.